1. i truly appreciated jane's softly, softly post this week. i too wrote about giving way to softer sentiments awhile ago and am increasingly disarming myself, so i immediately felt a kind of fellowship in reading jane's account of exploring her own taste for softer notes. 2. speaking of soft sentiments, i also loved anabela's feature on this week's closet & casa. it is so naturally and perfectly her. i love how anabela's style is so honest and uncontrived, while still inspiring awe. i will be honest in saying that she has undoubtedly influenced me in embracing my softer side in my own particular way, and i don't think i am the only one on whom she has had this effect! 3. in my seemingly never-ending browsing for wedding inspiration, i have recently become enamoured with honey of a thousand flowers. sarah's gorgeous garden aesthetic speaks for itself. 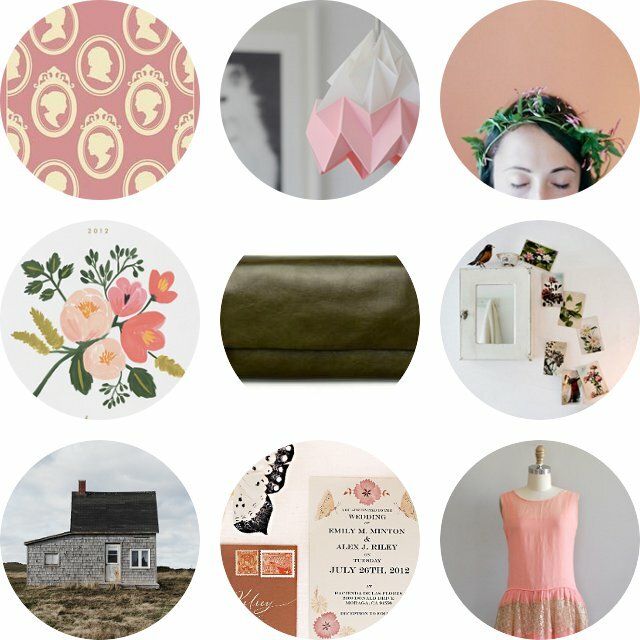 4. rifle paper co. is having a wonderful 25% off calendar sale that continues until monday. i already ordered this botanical beauty. 5. status anxiety's audrey wallet in dark green! 6. i've been slowly collecting antique teacups, and i love this playful idea for displaying art (via Poppytalk). 7. i love the east coast photos from nikole's recent blog post by photographer michael graydon. they are part of a story called "the scent of salted air" in volume two of kinfolk telling of a roadtrip to Prince Edward Island. the sense of atmosphere is perfect. 8. julianna swaney is one of my favourite artist's, so naturally i love her wedding invitation design for the recentlly launched one handspun day. while the collection is a little too soft and feminine for andew and me, i love it nonetheless, and i'm sure that it will make the right couple's hearts flutter. 9. gorgeous coral silk chiffon 1920s flapper dress from the ever-lovely dear golden.